There's no doubt about it. We would live in a much better world if we would simply follow the lessons of the great Dr. Seuss. Take The Sneetches for example. You remember that story, right? The Star-Belly Sneetches would brag to the Plain-Belly Sneetches, "We're the best kind of Sneetch on the beaches.” And the Star-Belly Sneetches would shun the Plain-Belly Sneetches at playtime and social occasions. One day a huckster named Sylvester McMonkey McBean came to town with a machine that could apply or remove stars. The starless Sneetches paid lots of money to get stars. 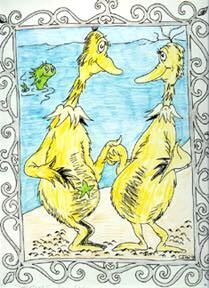 But then, the Star-Belly Sneetches quickly had theirs removed and declared themselves still the best. That started a star-on, star-off frenzy, with McBean raking in the cash. Eventually, nobody knew who was the "better" Sneetch. "The delays are the opponents fault. They're obstructionists." But, the problem is, that, for the most part, the people pointing that finger were once opponents themselves (to the county's project) and they caused delays. They were the obstructionists. So, let me see if I have this straight -- the proponents that were once the opponents that caused delays are now saying that the opponents are causing delays, and the proponents that were once opponents say the opponents are obstructionists and the opponents are saying that the proponents were obstructionists... and my man McBean is a-grinnin' in the corner. Let's take a look at a recent example of this whole "Star-Belly/Plain-Belly" confusion thing. In the latest Bay News, LOCSD President Stan Gustafson calls LOCSD Director Julie Tacker an "opponent" and then he blames the delays and escalating costs of the project on the opponents. But Gustafson, was a member of The Solution Group, and in 1998 The Solution Group was the ultimate opponent. It can easily be argued that ALL delays stem from them, Stan I am (to borrow some Dr. Seuss alliteration). So, I just don't know. Who is the Star-Belly and who is the Plain-Belly? It's all mixed up. When Gustafson, LOCSD Vice-President Gordon Hensley, and former LOCSD board member Pandora Nash-Karner (all of whom were members of The Solution Group before becoming members of the LOCSD board, and, as board members, they all pursued their deeply flawed plan despite the fact that there was an overwhelming amount of information that showed that The Solution Group plan was not going to work [and after after months and months of delays, it didn't work! ]), point at the "opponents" and say that the delays are their fault, they are doing so with a very rich history of being opponents that caused massive delays. It seems to me that the Los Osos CSD would be better off if, before pledging allegiance to the flag, they were to begin every meeting with a Dr. Seuss recital. "The day they decided that Sneetches are Sneetches and no kind of Sneetch is the best on the beaches. That day, all the Sneetches forgot about stars and whether they had one, or not, upon thars."